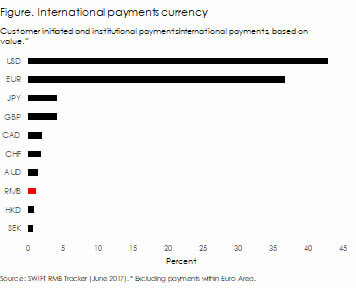 The latest SWIFT RMB tracker about the share of currencies in international payments shows that the dollar is used in 43 percent of international payments while the renminbi is used in 1 percent (Figure). This summarises the gravity of the U.S. seeming disengagement from international cooperation and exchange. While the dollar dominates international exchange, the U.S. is increasingly pursuing a national agenda. This is at odds with the building blocks of the international financial architecture. The current U.S. stance departs from a traditionally firm international commitment. U.S. President Kennedy in an address to Congress in July 1963, in a situation where the U.S. faced important balance of payment problems, announced: “I want to make it clear that, in solving its international payments problem, this Nation will continue to adhere to its historic advocacy of freer trade and capital movements […]. I want to make equally clear that this Nation will maintain the dollar as good as gold […], the foundation stone of the free world’s trade and payments system.” While U.S. president Nixon of course suspended gold convertibility in 1971, the link between international exchange and the role of the dollar has remained. The dollar’s importance rests on its universal acceptance as medium of exchange, unit of account and store of value. Dollar-denominated assets are held by central banks to manage international financial transactions or provide liquidity for orderly balance of payments adjustments. 63 percent of central banks’ foreign exchange reserves are denominated in dollars. Most commodities are priced in dollars. The rest of the world and in particular China maintains a persistent high demand for dollar assets allowing the U.S. to issue equity and debt nearly unencumbered. The U.S. became the largest debtor to the rest of the world without a threat to the stability of the dollar. The U.S.’ exorbitant privilege is alive and kicking. China remains highly dependent on the dollar. The importance of the dollar for international transactions and for China’s monetary policy framework mean that China is tied to U.S. monetary policy. For the second largest economy in the world to depend on a third-country’s currency is highly problematic. China will struggle to fight a trade war if it does not control the currency it trades in. China has long recognised the importance of reducing its dollar dependence. In 1996, China accepted the obligations of the IMF Article VIII to allow convertibility of the renminbi for current transactions. In 2004, it initiated cross-border transactions in renminbi and banks in Hong Kong started to offer renminbi-denominated deposits and undertook different initiatives including the dim sum market in Hong Kong, the off-shore renminbi market, the renminbi qualified foreign institutional investor scheme, the Shanghai Free Trade Zone. In 2016, the renminbi is included in the IMF SDR basket. Yet, renminbi internationalisation has remained elusive. New financial technology now offers an innovative approach towards renminbi internationalisation. China has been pursuing vigorously efforts towards a central bank issued digital currency and is expected to launch a digital renminbi in the near future. The idea of a digital renminbi to be much better suited to facilitate international payments by offering new advantages over conventional currencies could be the most promising approach to overcome the dollar’s dominance. The possibility to establish a digital renminbi ecosystem and new technological approaches for building trust and transparency in international exchange and provide novel liquidity facilities may offer a new trajectory for renminbi internationalisation. China is set to advance renminbi internationalisation on the basis of new financial technologies. While merchandise trade matters, the monetary side of international exchange matters far more. If China can advance renminbi internationalisation, the U.S. will be by far the biggest loser.